Some Zwifters are fortunate enough to have a hardwired ethernet connection to their Zwift station. But many are not! Pain caves are often located far from the central connection, perhaps even in an outdoor shed. 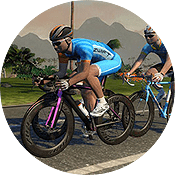 Poor WiFi at your Zwift station can wreak havoc on the quality of your experience, especially in hard group rides or races. Before I upgraded my home WiFi I had it happen regularly in races: the dreaded Internet drop. All the riders would disappear and I would have to jump on the pedals to make up for a lack of draft, suffering in hopes that the Internet would return before the pack rode away. It was (literally) a painful experience! I should mention that not all Internet drops are caused by weak WiFi. Your ISP may have problems upstream which mess up your Internet connection. That said, more often than not slow or spotty Internet is caused by a poor home Wifi system. If that’s the case at your house, it’s time to take a look at mesh WiFi! Many homes simply use a single WiFi router, and the further you get from it the slower your connection becomes. Some homes extend that router with “repeaters” which help but also complicate things by creating additional networks and slowing your overall connection speed. Mesh WiFi technology has been around a while, but until recently it was very expensive and difficult to set up. 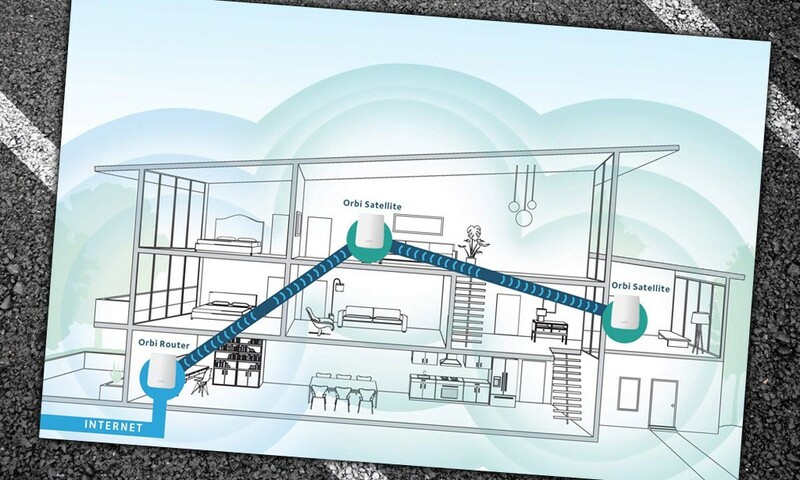 It consists of a main router that connects directly to your modem, and a series of satellite modules, or nodes, placed around your house for full WiFi coverage. Here is the important part: the main router and its nodes are all part of a single wireless network and share the same network name and password, unlike traditional WiFi routers. So you can walk anywhere in your coverage area and get fast, stable WiFi. The best WiFi solution for you depends on a variety of factors, but today I’m going to recommend one which will meet the needs of most Zwifters. That system is Netgear’s Orbi Whole Home Mesh WiFi System. 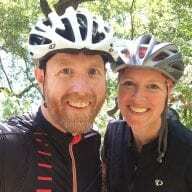 Why do I recommend it for Zwifters? I’m glad you asked! Speed: Netgear’s patented tri-band tech makes this the fastest system around, since it uses a dedicated WiFi connection to maintain the mesh “backhaul” instead of piggybacking on your “production” WiFi. Simply put: data flows in a few lanes, not just one. That makes things faster. Hardwired Connectivity: every station has 2 ethernet jacks (4 if you upgrade to the ultra-performance system), so you can plug straight into a node and get fast, stable Internet from your Zwift station. Coverage: Orbi’s cheapest router plus two extenders covers 6,000 sq feet. Higher-performance models cover even more area per node. I’ve used Orbi for a while and swear by it. If I could justify buying the upgraded Pro version I’d be there like a shot. I researched this A LOT before I splashed the cash. This is my trade. I’m also a certified wireless specialist. … no matter what I always came back to the Orbi purely on technical specification. It’s no looker but it works. And everyone I know I’ve recommended it to also recommends it because it works so bloody well. 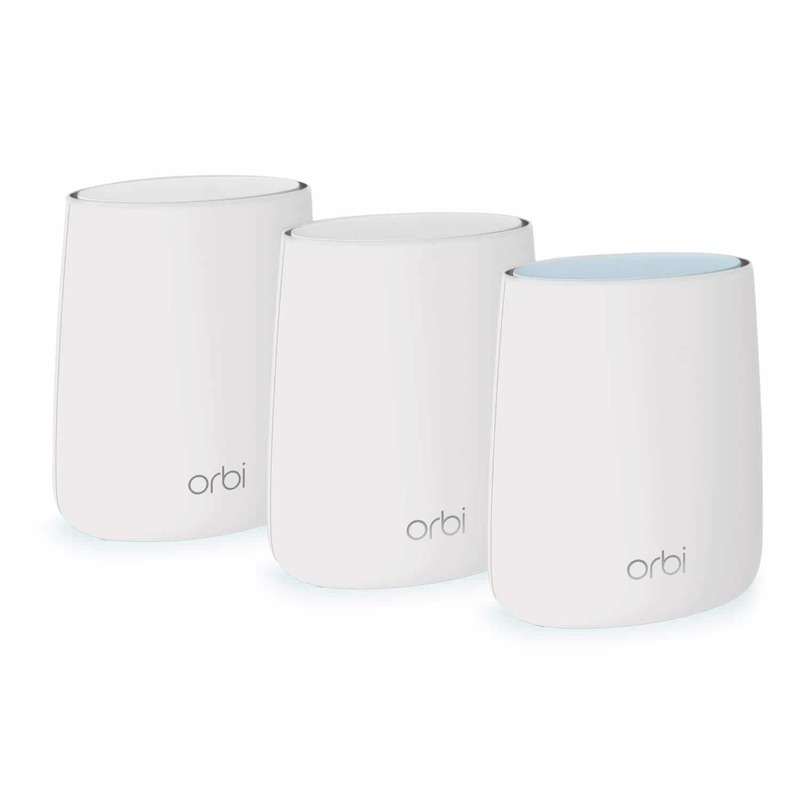 If you’re looking to upgrade your home network and get a stable network connection for your Zwift station, give Orbi Mesh a look. You’ll be glad you did! Not exactly, although I do include Amazon affiliate links to buy the Orbi system. I wrote this post after upgrading to mesh recently myself, because I hear story after story of Zwifters’ WiFi woes! Have they fixed their Ethernet backhaul feature? I can’t talk for Orbi but I have used Google home WiFi (Mesh Technology) for 3,000 miles on Zwift and never had any drop issue. Another likely reason why Computrainer gave up on launching their WiFi version. Too bad they found it necessary to close shop before newer SOHO mesh technology became available. I am using a room that was some distance from my wi-fi. We also had problems when we had visitors over the holidays. It seemed that to many phones and iPads just caused the system to stall. Now we have great wi-fi all over the house and the deck too. I was riding Sunday with Amazon streaming and the Zwift running. No connectivity issues and running better than ever. When the family visits for Christmas all they have to do is scan my Orbi QR code on my phone and their phone will log on and set up the password automatically. A total assume system and very pleased Five Stars! I had okay wifi but knew it was dodgy at times at the far end of the house (where of course the indoor trainer resides) so I decided to go for the Orbi setup. Been using it for about a week and it is has been solid. I notice fewer times when the Companion app disconnects as well, so glad to see an improvement there.